This was my Cinderella moment, it was midnight, and I had to depart the palace before the spell wore off. For Dr. Whitney Young Ph.D., running away from her painful past was secretly her motivation. The further away she was from her family the better, and a teaching opportunity in the country of Vauxlance was precisely what she needed to keep her far away and focus on her career. Prince Philippe De Le Stefan is the crown prince of the small western European country of Vauxlance. He’s also filled with pain due to the mistakes of his past. He’d give anything to be free of the guilt that plagued him. A chance meeting at a lavish party brings together the two broken hearts of the economics professor and the prince. 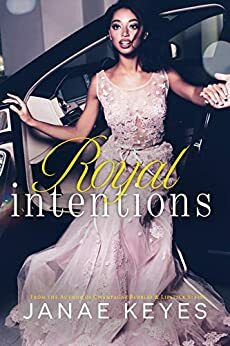 Caught up in the excitement of romance, fast-paced lifestyles, celebrity, and academics, can the dynamic couple survive the pressures placed on them by outside and internal influences? “My apologies, your highness,” I said addressing him. He’d taken my hand back into his and we continued our stroll up the incredibly long hallway. I swore it had to run the length of the city block outside. I was walking hand in hand with a prince and in a palace. The energy that flooded me was all consuming. I wondered if this was how Diana felt for the first time with Charles, Kate with William, or Megan with Harry. There was an unmistakable connection forging between the two of us who’d only met a short time ago. I took one step at a time until my foot stepped down on something hard and slippery. My body lurched backwards and I went tumbling toward the ground, yet I never hit the ground. Philippe acted quickly and yanked me to him at a rapid pace. My body pressed to his. His physique was rock hard and his strong arms held onto my body tightly. My heart stopped, and not a single breath left me. Philippe’s face was inches from mine, his olive eyes searching mine for signs that I was okay. “I’m fine,” I breathed as his hand gripped tightly at my waist. I relaxed into his hold, he was protecting me as if I was a precious piece of crystal. Philippe’s eyes diverted from my own, and he observed the floor. He took his foot and kicked away a single marble. The small glass ball rolled across the carpet and onto the exposed stone floor before resting against the wall. “My little brother,” Philippe grunted in dismay. “You have a brother?” I questioned. Honestly, I didn’t know much about the royal family, and the only child I’d heard of was Philippe. “Yes, he’s 12.” He nodded in the direction of a portrait of the current royal family. King Olivier standing tall, his wife Julianna seated with a baby boy on her lap. Next to Julianna stood who I assumed to be Philippe, he was an older teenager, but in front of him also stood a small girl. “You have a sister as well?” I asked, noting the little princess in the painting. “I’m so sorry for your loss,” I expressed as his eyes greeted mine. He gave me a weak smile in response. Today's Book of the Week is Hidden Witness by Posey Parks. Last night I started reading the book and finished it off today! Wow! This book was totally everything. In the beginning, I just wasn't sure of the direction it was going. I was totally on a "this has a lot of POV's." Then as I continued reading, it all clicked together for me and I was addicted to reading about every single character. Their thought process at the time. The way that the felt about the situations that they were coming face to face with one at a time.